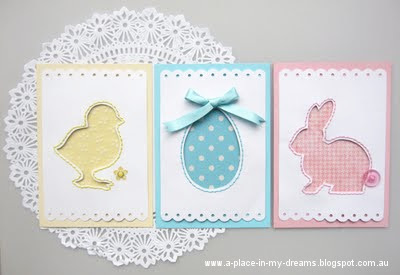 I couldn’t resist sharing a roundup of some of the cutest and prettiest handmade Easter Cards I’ve seen. I hope you agree that this is a brilliant selection and get inspired to have a go yourselves and create some special cards for friends and family. This is just completely adorable! I think this would be great card to give or to receive for kids and grown ups alike. I wonder where this little fella is off to? Perhaps we’re searching for our Easter eggs! 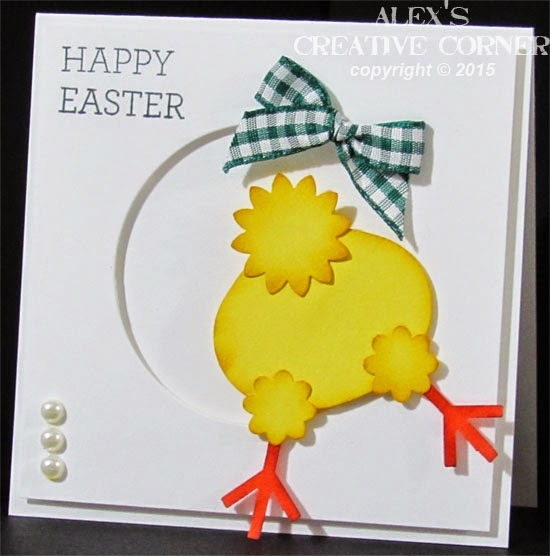 I particularly like this card as it’s just a little different from the usual Easter chick greetings cards and shows a novel approach. Image source and how to make information can be found here. 3. A Quilled and Quiffed Chick! 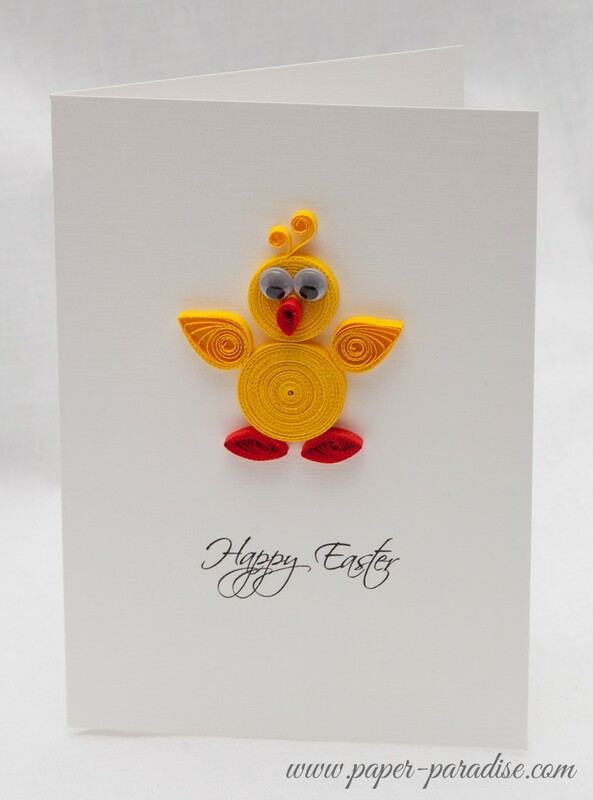 This card has been made using a quilling technique resulting in a vibrant and quirky chick fronting the card. This card just shouts sophistication, class and elegance to me. 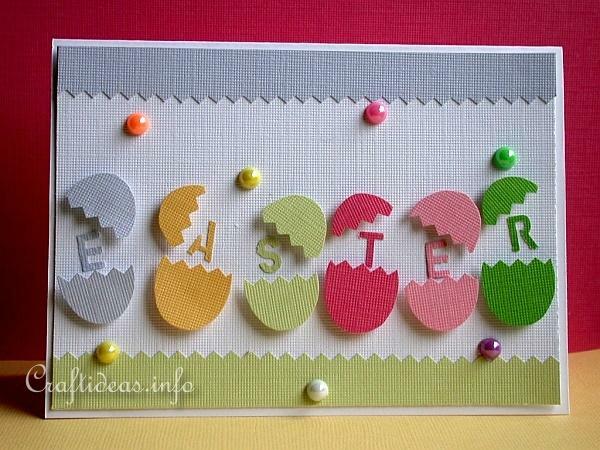 I love the colour scheme, the delicacy and the intricacy of this beautiful Easter card. In many ways it reminds me of a finely iced and decorated wedding or christening cake. Do you agree? This is a really neat card. To my mind it has plenty of interest but clean lines and not over fussy and doesn’t rely on cute chicks or bunnies to let you know it’s Easter. It also brings some great colours to the party with a fresh, attractive and springlike look. You can find the instructions to make this lovely card at www.craftideas.info. 6. A Triumvirate of Treats! These three cards are so cute. Designs like these in pretty pastel colours (particularly the bunny) would work well for new baby cards or, of course, Easter. These work well as simple, cute designs or you could add some “bling” if you wanted to. Image source and instructions can be found here. To have a go at making your own special Easter cards, we like this springtime pack of cardstock from CraftStash with its selection of pastel colours ideal for any Easter project.